For this 30th Sunday in Ordinary Time, 10/27/13 Rev. Beverly Bingle of Toledo, Ohio has given us a powerful and poetic Homily. After her homily is Rev. Lee’s Commentary. The purpose of the Commentary is to make this an interactive homily of the style many women priests use in their churches. First the Priest sets the stage and gives a brief homily or introductory thoughts and invitation, then the congregation is invited to respond and share their own thoughts on the readings and the thoughts of the Priest. Readers are invited to add their comments in our global parish. Our weather has turned this week. Last mowing of the year. Gardeners scurrying to bring in the harvest. And a marked increase in the number of guests at Claver House. in the Lord’s Prayer on Thursdays, was late. volunteered to lead us in prayer before the meal. for the warm and safe shelter of this room. they aren’t, even though they all use prayer as the context. they find their prayers heard. so they reap a harvest of justice. who give thanks to God for dwelling in them. with another variation on this righteousness. another of those that scholars believe came from him. a God of love, of compassion. Jesus’ use of parables, here as elsewhere, is not meant to inform. as if it were the sole purpose of the parable. Nor is Jesus telling us to sit in the back of the church and grovel. that will bring us to the experience of the kin-dom of God. carefully following, even exceeding, the letter of the law. He is a good man, doing everything he is supposed to do. 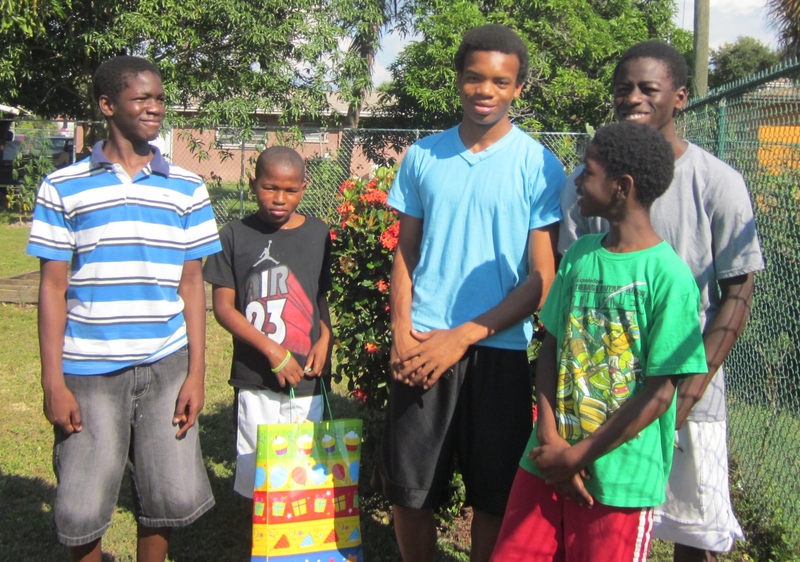 He is admired in the community for his way of life. But he does not go home justified. for giving him the opportunity to do good things. The Pharisee does not go home right with God. but he does not see God for what God is. or others for who they are. and he’s on the wrong path. On top of that, he doesn’t know he’s on the wrong path. The tax collector is not a model, either. and who God is—the Merciful One. So he is in right relationship with God. to oppress his own people, his own neighbors. so that he is also in right relationship with people. from the one held by the authors of the scriptures. in our understanding of who God is. The way we used to see God is no longer believable. no longer make sense to us. are no longer real for us. Happily, real experience and real life remain. and we try to understand. always through our embodied spirits, our inspirited bodies. reaching out, welcoming, including everyone, loving. We meet people like Mitchell. about their experiences of transcendence and immanence. We watch the falling leaves and the full moon. the pink sunrises and the golden sunsets. We pet our cats and hug our children. and we find a mystery full of grace. I love Rev. Bingle’s homilies, that is why I put them in this blog. -so you can enjoy them too. And, so you can reflect on who God is and where justice and compassion fits in your relationship with God and your neighbors as she does. Her work in a soup kitchen brings her close to truly humble and unpretentious people. As she notes Mitchell’s prayer is truly beautiful and God is delighted with it. The Mitchells in my church are Nathaniel, Gary and Lauretta and Donnie, Mrs.Jolinda and others. Sirach lets us know clearly that “God listens to the prayers of the exploited”( Sirach 13b TIB-The Inclusive Bible Translation.) Sirach also asks us to give of ourselves…and that is a very different posture than the Pharisee who prays putting others down in the Gospel of Luke. But it helps put us right with God. And, even as Rev. Bingle and I and our church members do prioritize serving the poor-including the poor serving one another-we may become the answers to the prayers of those who have little of this world’s goods like the widows and orphans in the time of Sirach,Paul and Jesus. And we may learn how to pray and do justice along with our theology. I fully empathize with Paul in his letter to Timothy-an elder encouraging a younger church leader by sharing that it is Christ who strengthen’s him so he can proclaim the Gospel even as his life is “already poured out like a libation”. In this prayer I am feeling that while I may be stardust and that God’s everlasting love is within me and all around me, I sometimes mess up big time. I have in the past, I do in the present, and I probably will in the future. I am very human and while I fight the good fight and keep the faith like Paul, I do not always win that fight. I get tired, angry, irritable and downright selfish at times. I do not even aspire to being “exalted” but I do aspire to being right with God and my neighbor. I am therefore happy with a theology that includes God’s forgiveness for sin-both individual and social. And social sin, that is the sin of socio-economic systems and governments and powerful folks who exploit others is the worst sin I know. I have no trouble with that word or concept-I do know what it is and have been there. Moreover, I serve people who have been there as well-yes, murderers, yes, adulterers, yes, exploiters of others, yes to breaking the laws of Loving God first and our neighbors as ourselves. So with all due respect to Michael Morwood,whom I have dialogued with, and the God within, the God who is MORE and truly beyond our understanding-might I dare say even beyond the Cosmos- is the one I often need. As one of my people said” I need the Jesus who comes to me when I am alone and scared and feeling lower than a snake’s belly”. Yes, I do understand that new Cosmic understandings make us question “old” formulations, but neither old nor new encompass the God who is MORE. I don’t feel like a babe in the new woods of understanding God, but more like a weaver who gets a hold of and weaves strands of gold and silver, rust and green together, the loving essence of the “old” and the “new” to make a chain of living strands that hold us to our loving God and instructs us in right living. Amen,to the mystery full of grace. Amen, sister Beverly,Amen. What do you think our sisters and brothers ? God is always" More than" we can imagine or dream of. The Holy One loves us beyond our wildest dreams, is within us and in all living beings. Let us rejoice that we are stardust and dance the cosmic dance of creation with delight each day! MN archbishop's answer: "I'll hire more lawyers"
In response to scandal stemming from secrecy, Archbishop John Nienstedt proposes more secrecy. He does one thing today – he promises hiring more lawyers. That’s all. The rest of his column is just more promises from a powerful prelate who keeps breaking old promises. Here’s the only real change: Soon the number of hand-picked, church-paid lawyers looking at predators' files will go from six or eight to 12 or 14. That's not progress. Those files – all of them – must be turned over to law enforcement. Despite his protestations to the contrary, this is “clear” to Nienstedt. But he refuses to do it. The job now isn’t adults “feeling peace” or their “trust” being “restored.” The job now is protecting kids. Nienstedt’s words don’t do that. His actions might. But he refuses to take concrete steps to safeguard children. And he is refusing again today to do that. None of Nienstedt words today protect one kid, expose one predator, discipline one enabler, uncover one cover up or deter one crime. What is "Inclusive Catholic Ministries?" 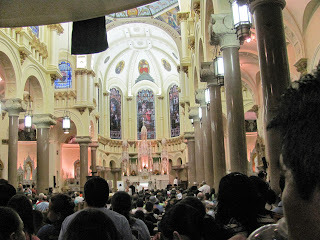 We want to maintain the best of our Roman Catholic heritage and traditions. We want to invite EVERYONE to participate in God's love and our ministries and we use inclusive language. We want to offer what you the people of God want and need. We are starting with several ministry outreaches. Come and see if this is the faith community you are seeking. This is a one hour documentary DVD sharing how women were in truth priests in the early Church and how women are seeking to make this happen again today. What an awesome month September was for me and Miriam. 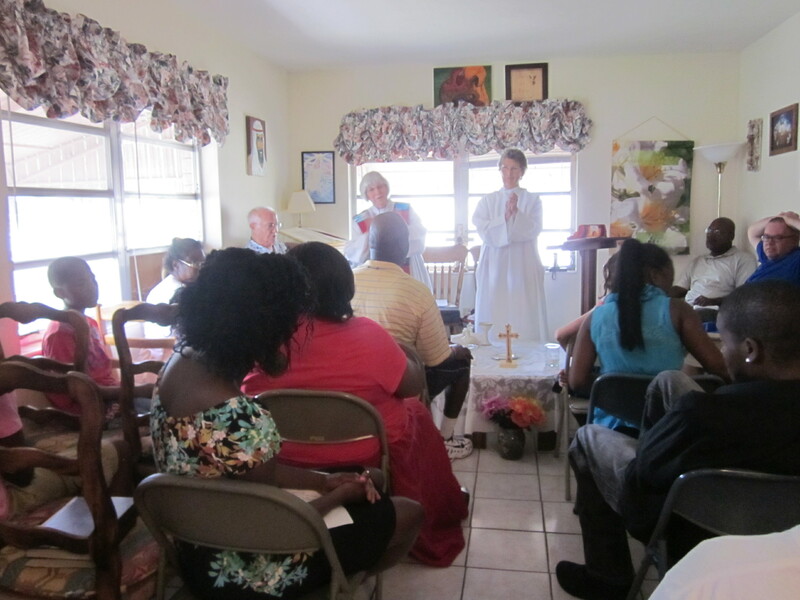 Miriam presided at her first wedding as a priest and went to the ordination of another ARCWP priest and two deacons in New York. She will write about that later in this news letter. I went to the Sisters of Loretto Mother House in Nerinx, Kentucky where fourteen of us had a reunion of the class of 1963. Fifty years ago we were all novices with the Sisters of Loretto. It was a fun and spiritual time for all of us. Two of our class mates celebrated their golden jubilee at Loretto. We had fun surprising them with cake, ice cream, cards and gifts. They had fun having us join them at Loretto where we talked with sisters we have known over the years, walked to the “world” (to the main highway off the Loretto grounds which we named “the world.” vs. the spiritual grounds where we were being educated and trained to be sisters. ), hiked to the lake and to the retreat cabins on the grounds, shared joy-filled and painful stories about our lives at Loretto and since we have left. It was a joy-filled and healing time for all of us as we re-connected and quickly resumed just as we left off many years ago. What a blessing my Loretto experience has been in my life. I would not be the person I am today were it not for the time and experiences I had at Loretto. From Loretto I drove about 30 minutes to the Sisters of Charity of Nazareth in Bardstown, KY. I stayed with a dear friend, Jo Ann, who lives on the campus and who is the Director of the SCN Associates. I became an associate when I lived in Kentucky and first met Jo Ann. I arrived on Labor Day and the associates from TN made bar-b-q for us. YUM!! 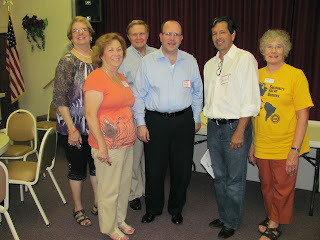 It was a delight to re-connect with friends at Nazareth and make new friends there. One friend has been very ill and it was an honor to pray for her healing. Later I learned she was in remission from cancer. Yea, God! 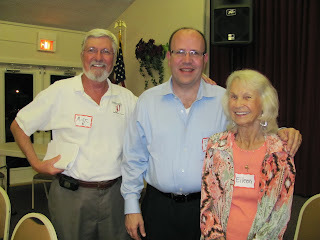 A new friend’s ministry is to take those who have cancer to their treatments. She is perfect for this since she has a great sense of humor. Two friends came over from Frankfort the next day and it was wonderful to recall fun times together and to make a new memory. From there I went to Charlotte, NC where we had lived for 6 years and met some wonderful people there. It was great to re-connect with friends who had been a big part of my learning more about myself and accepting me as an adult. We had dinner together with several and reminisced about old times and shared about what has been happening since we were last together. 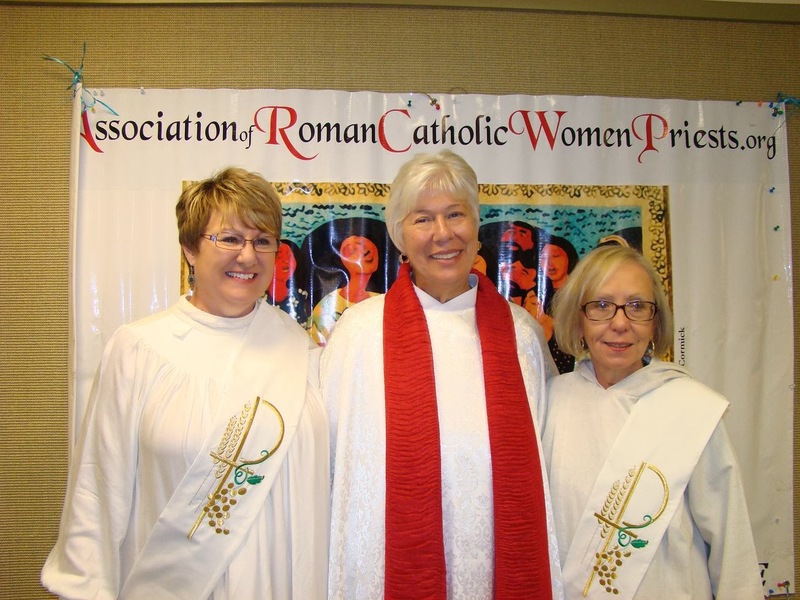 Ruth, Susan, Nancy and CJ had come down to Florida for our ordinations. What a delight to see them again! His new private residence will cost €31m and include a €15,000 bathtub, furnishings worth €380,000 and a garden that came with a €783,000 bill. But the "bling bishop" of Limburg is unlikely ever to enjoy the benefits of his luxurious new home, after he was temporarily suspended from his post by the pope yesterday. In a press statement, the Vatican said it had been confronted with a situation in which Franz-Peter Tebartz-van Elst "could not follow his duty as bishop" and had decided to allow him "some time outside the diocese". A final verdict on the bishop's future is expected after the completion of an internal investigation into the Limburg building project. Tebartz-van Elst has come under increasing criticism since the estimated cost of his new residence – described by some newspapers as "palatial" – rose to €31m (£26m) earlier this month. It is hard to imagine a greater contrast between the alleged luxurious living habits of the German bishop and the ascetic style of the Argentinian pontiff, who, from his first hours in office, has made clear his desire for "a poor church … for the poor". Shunning the large and opulent apostolic palace, the pontiff has chosen instead to live in the simple surrounds of the Domus Sanctae Marthae, a Vatican guesthouse. He often travels in used cars and has urged priests to do the same, telling them: "If you like the fancy one, just think about how many children are dying of hunger in the world..."
WHO: Members of the National Campaign for Nonviolent Resistance [NCNR] have been active in challenging U.S. invasions and attacks on Afghanistan, Iraq and other countries. On May 23, 2013 members of NCNR filed a criminal complaint with the U.S. attorney’s office in Alexandria, Virginia against the CIA’s use of drone strikes to assassinate people in various countries, including Pakistan. The citizen activists never received a response. 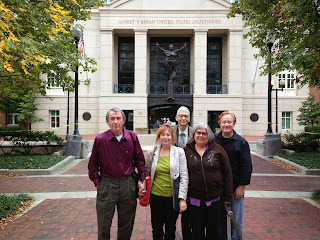 WHAT: Just prior to trial, Cindy Sheehan became ill with a virus, pled guilty and paid a fine. The other defendants, representing themselves, appeared before Magistrate Judge Ivan D. Davis for trial. He explained that the government has established “This is not a trial about drones.” Stacy Chaffin, an assistant U.S. Attorney working for the CIA, presented one witness, a police officer, who described the die-in was a result of a simulated air strike. He may have been coached not to say “drone.” When Obuszewski cross-examined the witness, Davis would not permit the defendant to show the letter to Brennan to him. In the police officer’s testimony, he stated that Major Burton accepted “information” from the defendants, carefully avoiding the word letter. It became obvious that Judge Davis would not permit any defense arguments which called attention to the defendants’ First Amendment right to petition our government with redress of grievances or that as citizens the defendants were authorized to be at the CIA to challenge an illegal assassination program. The CIA would be protected in Judge Davis’ courtroom. In his judicial opinion, the defendants were there, they were unauthorized and thus arrested, and they were found guilty. WHY: The prosecutor, employed by the CIA, was unwilling to challenge her employer. Obuszewski had sent her an email query: “If you believe that it is legal to assassinate four U.S. citizens, including a child, please provide us with the lawyerly justification. If you can’t provide us with a legal memorandum supporting an assassination program, then consider dropping the charges against us instead.” She did not respond. Both Kilbride and Obuszewski were lectured by the judge about relevance. The criminal complaint, the letter to the CIA requesting a meeting and the recent Amnesty International report on U.S. killer drone strikes were ruled irrelevant. The defendants were not allowed to indicate their Nuremberg Obligation to speak out about the illegal activities of the U.S. government. First, a grandmother, testified about her concern for children around the world. At the CIA she held a photograph of child victims of drone strikes. Sevre-Duszynska, a Roman Catholic womanpriest, testified that besides doing liturgy her mission was peace and justice. A retired ESL teacher, she told the court about educating students from war-torn countries and emphasizing mediation as a means of settling disputes. First, also presented a moving closing statement. The prosecutor indicated that the defendants were nonviolent and not a threat, and recommended unsupervised probation. Before sentencing all defendants, but First, spoke to the court. Runkel, an archivist of Dorothy Day since 1978, spoke about the work of the legendary co-founder of the Catholic Worker movement. Kilbride became emotional as he described being a Quaker and what actions that entails. Sevre-Duszynska reached back to talk about her Polish-American upbringing in Milwaukee, and how the seeds of her activism were planted by her grandmother and grandfather. She also explained how horrified she was when she attended a conference in Nevada where killer drone strikes were extolled. The sentence given was unsupervised probation for one year, a fine and cost costs of $335 and an order not to be arrested during this period. This will a difficult test for the activists, as they have been involved over the years in many acts of civil resistance. Unlike other jurisdictions, the federal court in Alexandria required the citizen activists to report to probation and sign authorization forms to release confidential information—“employment records, educational records, medical record, and psychological and psychiatric records” to the probation office. Another document, if signed, would give authorization “for access to financial records.” The activists were stunned to read these forms, and protested vigorously inside the office. Eventually, the supervisor came out and agreed to waive the requirement to fill out these forms. Nevertheless, the probation office will review every ninety days to see if the convicted were arrested. This is the most onerous “unsupervised probation” any of them have ever experienced. Regardless, the activists intend to continue to speak out against the killer drone program and other government policies which are deemed unjust. WOW! 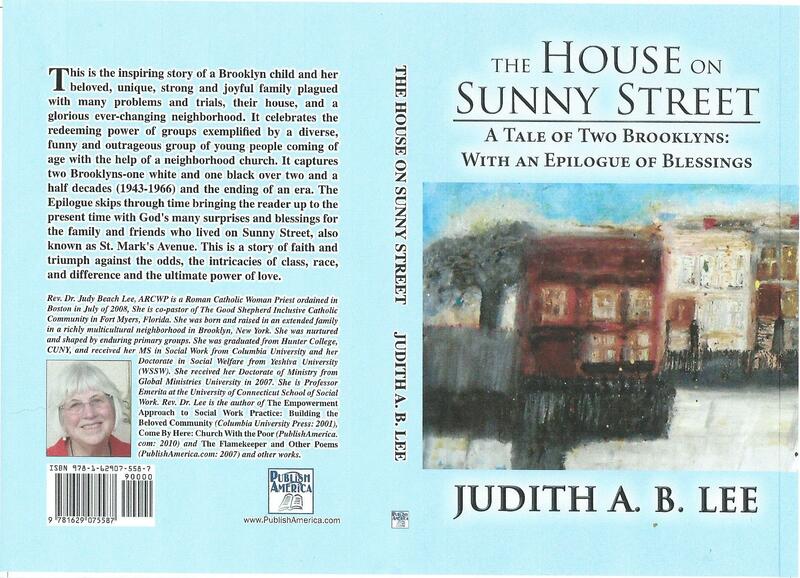 It is Ready For Ordering- The House on Sunny Street by Rev. Dr. Judy Lee-Check it out! I am excited to share this autobiographical and historical novel with you. It is hot off the Presses and you can go to Publishamerica.com or Publishamerica.net/bookstore or to Amazon.com to get it. It is available in paper and electronic forms. If you have ever wondered what makes people tick, what adds up to a human life, and what contributes to the life of a woman priest this book may have some answers for you. If you like books about Brooklyn, New York, or inner city life anywhere this is your book. If you know the power of groups and the power of faith, this book is for you. If you like stories about real people who overcame some serious odds and kept on keeping on you will not be disappointed. If you like to read about complex lives written so all can “get it” and laugh, cry, and cheer with the protagonists this is for you. If you believe in inclusion, justice and love you will enjoy this read! I hope you will check it out! If you do, please feel free to share your comments here. I welcome your responses. One cannot remember what or whom one does not know. Ecclesiastes 12:1- to remember your creator in the days of your youth is only possible if you know your Creator in the days of your youth. The Message translation of Proverbs 2:22 is clear: “Point your kids in the right direction-when they’re old they won’t be lost”. Most probably, though I sometimes may be disoriented, I am not lost today because of the wonderful teachers,pastors and examples from the church of my youth. Our kids are our passion. At our Good Shepherd Church we work hard so our children and youth will know the love of God and the way of the living Christ. 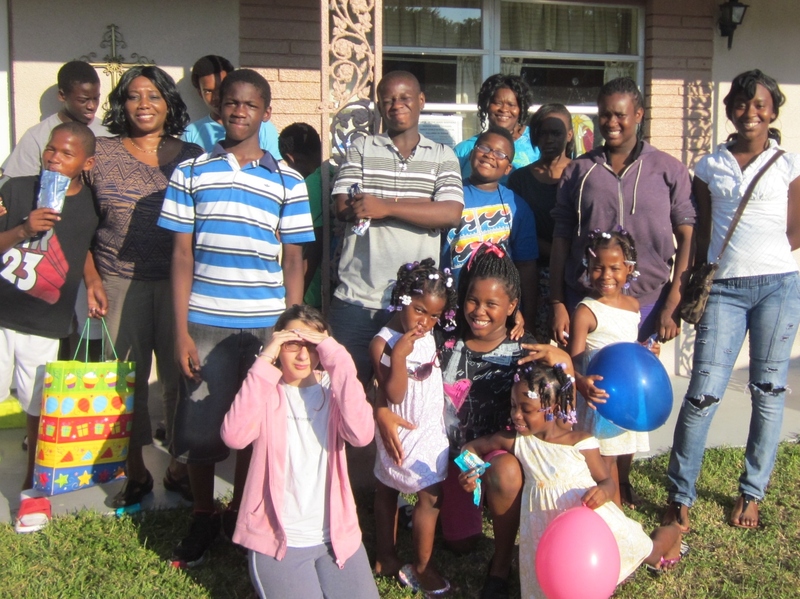 This reflection begins with a picture of the teen class at Good Shepherd Inclusive Catholic Community in Fort Myers, Florida on Sunday 10/20/13. These smiling teens (13-18) meet with me on Sundays after church and the Sunday meal. They are energetic and enthusiastic learners. They pray, they read the Scriptures on their own and they even do homework as it is assigned. They know the Great Commandments and try to live them. They are getting to know God and Christ in relationship. They are learning to serve and not be served. Some of them have been attending our Sunday class since 2009. Then, when I asked them and some of the younger kids who appear in the next picture: “Who created our universe? Who was born on Christmas? and What happened on Easter?” they did not know the answers. Now all of them know the answers in their heads and,more importantly, in their hearts. I have baptized twelve of our Sunday school kids. Some have graduated from the Sunday class and and now in their twenties are working or attending college. We have, perhaps, lost one young man to the lure of the gang,weapons, and drugs. I say perhaps because we are not going to let him go so easily. In the world these kids live in people are shot right in front of their homes. Economics is a very real problem and gangs promise alternate ways to get money as well as belonging and love. That we have only lost one so far is a small miracle, and one that we are working hard to continue. The love and support we offer to them and their families, the love of Christ, trumps violence and poverty and negative influences. It also trumps X Boxes and Nintendo/PlayStation/Smartphones type games that addict and supplant other forms of growth producing activities. There are many challenges we have to meet along with our kids. My heart is lifted every time I meet with these kids. Each child or young person is special to us, from the youngest to the oldest. It is our challenge to be the face of Christ to them so they can be that for each other and in their families,schools, and neighborhoods. Teachers Pearl Cudjoe and Linda Maybin are also in this picture. Below is Mrs. Pearl Cudjoe and the wonderful Junior class. 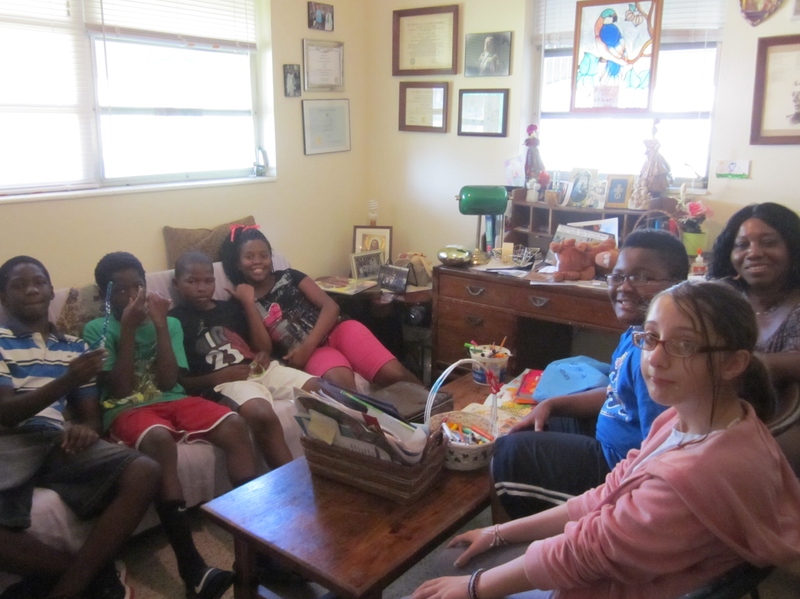 They are fourth through 6th graders (10-12). 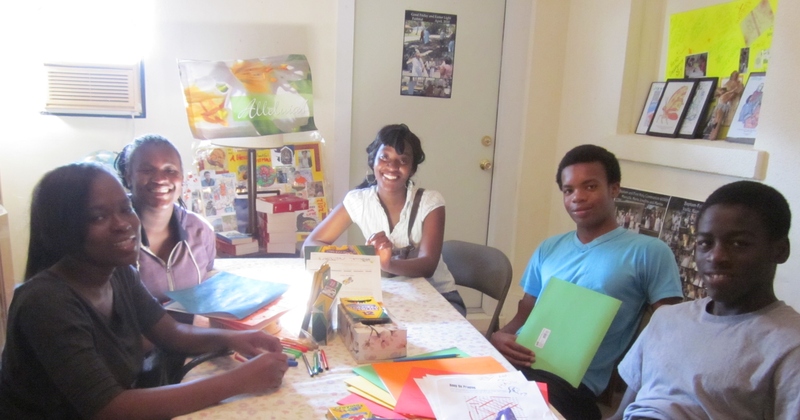 their growth and excitement is contagious and they love their Sunday class and teacher. Yet, emergent forms of church seem to be working. We are a renewed Catholic church. 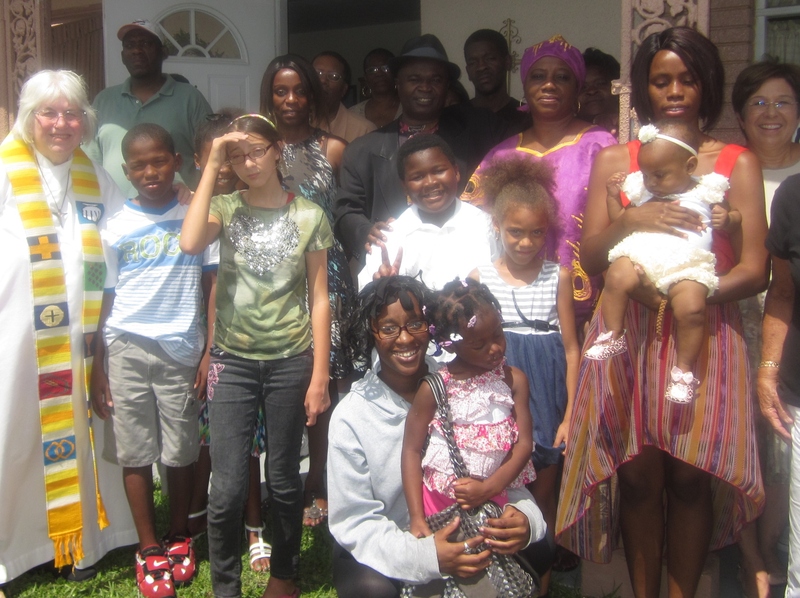 We bought a house in the heart of the poorer community and converted it into a church. We have women priests, validly ordained servant priests. Our form of liturgy and Eucharistic celebration is communal. All are welcome at the table of Christ, who is on the Table,at the Table and around the Table. 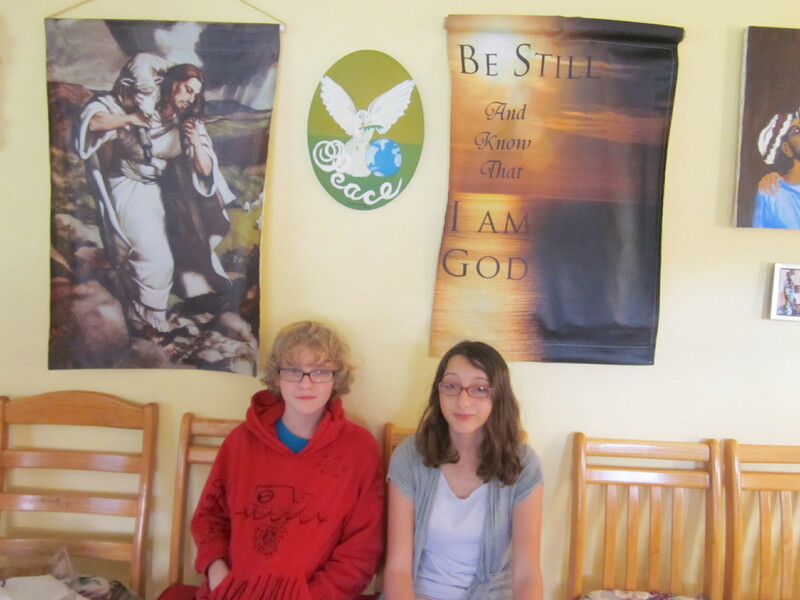 Within the last two weeks five new youngsters joined our worship and Sunday school. 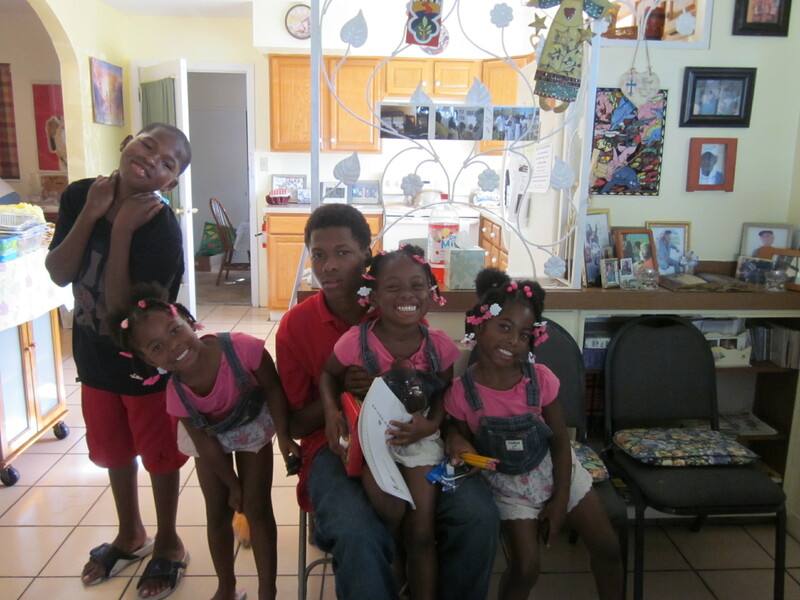 We are so pleased to have these new kids with their families. We pray that each child may know that she or he is loved and precious to our God as each grows and matures. For all of our children and young people, know you are loved and keep carrying the Christ light for others. On October 7, 2013 25 members of St. Andrew United Church of Christ, the Manasota Chapter of Pax Christi and MMOJ Inclusive Catholic Community gathered for a pot luck supper in the fellowship hall of St. Andrew UCC. Michael Rigdon, married priest partner of MMOJ led the grace. After our pot luck dinner and wonderful desserts, James Martin immigration attorney and member of MMOJ gave an update on the state of immigration policy in the US. 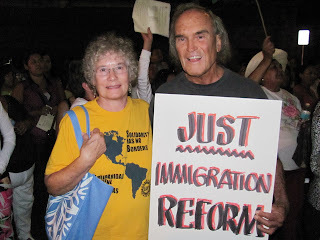 Jim was honest in his appraisable of US policy as it is written and enforced, “It is immoral and inexcusable.” He thought realistically, with the politics of today, passing comprehensive immigration reform “will be impossible.” The Democrats want a path to citizenship for immigrants already here; the Republicans want to secure the border and stronger law enforcement. Jim also spoke of the “browning of America” (immigrants of color) and how whites will become a minority by 2050. He argued that white politicians will do everything possible to remain in power in perpetuity. 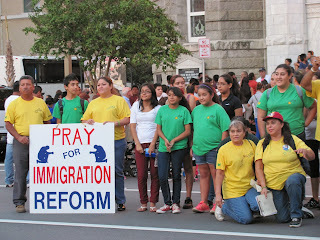 On October 14 Members of Mary Mother of Jesus participated in a prayer vigil and march from Sacred Heart Church in Tampa to the Federal building a block away. 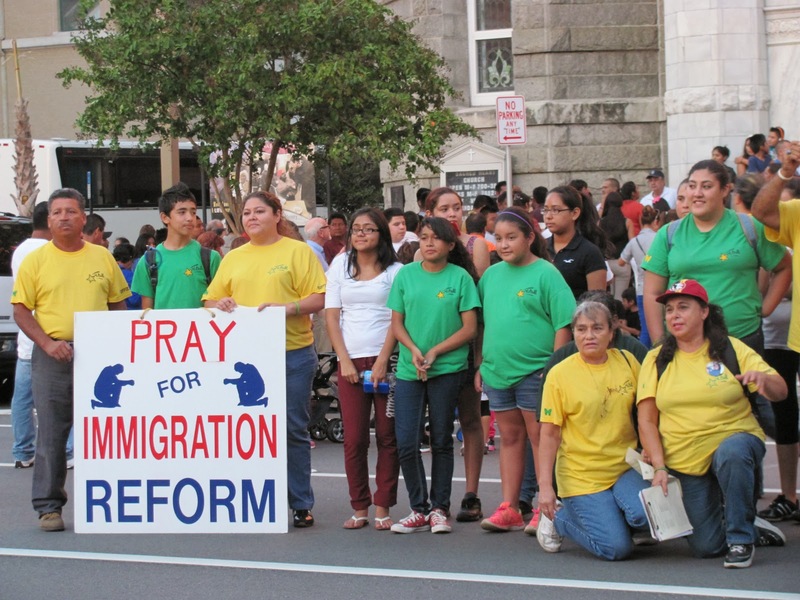 Over a 1000 people attended and marched and the church crowd overflowed onto the street. Bishop Lynch from the St. Petersburg Diocese led the prayers and gave a short homily comparing immigrants to the fleeing of Joseph, Mary and Jesus into Egypt and their return when it was safe. We are proud and thankful that members of MMOJ joined with others for equality and justice. Let us rededicate ourselves to supporting a fair immigration policy for those seeking economic and social justice in America. Let us make ourselves heard in the political process for justice and peace. "That's the title of a new book written by Joani Schultz and Thom Schultz. And it's a question those leaving are more than ready to answer. The problem is, few insiders are listening. And, of course, that IS the problem. In a recent issue of Christianity Today, for example, Ed Stetzer wrote an article entitled, "The State of the Church in America: Hint: It's Not Dying." He states: "The church is not dying... yes... in a transition... but transitioning is not the same as dying." Really? What cartoons have you been watching? Clearly, the Church is dying. Do your research, Mr. Stetzer. According to the Hartford Institute of Religion Research, more than 40 percent of Americans "say" they go to church weekly. As it turns out, however, less than 20 percent are actually in church. In other words, more than 80 percent of Americans are finding more fulfilling things to do on weekends. Furthermore, somewhere between 4,000 and 7,000 churches close their doors every year. 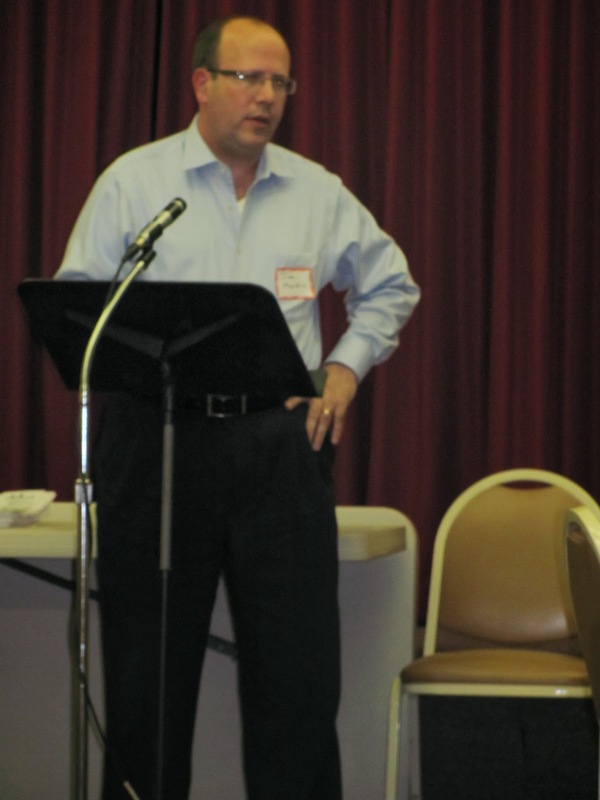 Southern Baptist researcher, Thom Rainer, in a recent article entitled "13 Issues for Churches in 2013" puts the estimate higher. He says between 8,000 and 10,000 churches will likely close this year. Between the years 2010 and 2012, more than half of all churches in America added not one new member. Each year, nearly 3 million more previous churchgoers enter the ranks of the "religiously unaffiliated."